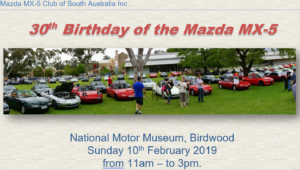 Mazda MX-5 Club of South Australia Inc. presents the 30th Birthday of the Mazda MX-5 at the National Motor Museum, Birdwood on Sunday 10 February 2019 from 11am – to 3pm (Museum open from 10 am to 5 pm). Mobile coffee and light snacks vendor on-site. General public welcome. No glass, no pets allowed. The MX-5 was released world-wide on 10 Feb 1989 at the Chicago Auto Show (with a price tag of US$14,000=A$19,400). All MX-5 Clubs in Australia are planning to hold an event on this day for the occasion and it is fitting we show Adelaide the strength and cohesion of our Club and both the social enjoyment and motor racing spirit it brings. We have booked the National Motor Museum display lawn area (and shade trees) at the rear of the main building of the Museum. The concept is to have the maximum number of Club members together and for everyone to invite as many non-members MX-5 owners or drivers to help us muster as many cars as practicable for a display that will also be open to all visitors to the Motor Museum on the day. Very similar to the successful day we enjoyed at this location for the 25th Anniversary in 2014. We can amass the same large numbers but only with your individual commitment to the event. The Blumel Rd gate will be the entry point for all MX-5s. This will be open for arriving cars from 10.00am until 11.15am. It will be a picnic day with a focal gathering area in the shade on the lawn where we will have some tables and chairs and hopefully some background music, while we have lunch and socialise. We have requested a mobile vendor of coffee and light snacks to be available on-site. It will not be an expensive day. 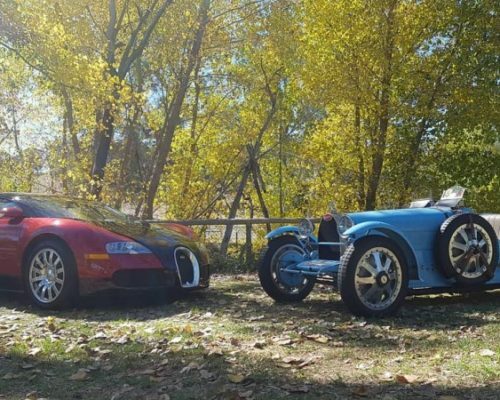 Your $20 per car (driver and passenger) entry includes the use of the facilities, access to the museum displays and piece of the big MX-5 cake to complement your tea or espresso coffee. Also your entry ticket will put you in the draw to win the Paradise Motors prize of an MX-5 for a weekend! Vehicle admission (cash only) $20 per MX-5 (with driver and passenger) & includes entry to the Museum pavilions. Anyone with an MX-5, bring it along for display. Meet & greet with other MX-5 owners & see the new, more powerful 2019 ND model – in fact, drive one yourself. Come along to be in the draw for the Paradise Motors prize of an MX-5 for the weekend! All MX-5s are welcome, regardless of condition, old and new – we want this to be the largest gathering of MX 5s at the Museum we can muster.